The Seated Liberty design was added to the U.S. quarter in 1838, joining the Half Dime and Dime, which began carrying the design the previous year. The image of Miss Liberty seated upon a rock while holding a Liberty cap on a pole became a fixture in daily American life for many decades. It wasn't until 1891 when the Seated Liberty theme was finally discontinued. A few varieties exist for the Seated Liberty Quarter, due to design changes in drapery, arrows, and the addition of the "IN GOD WE TRUST" motto. 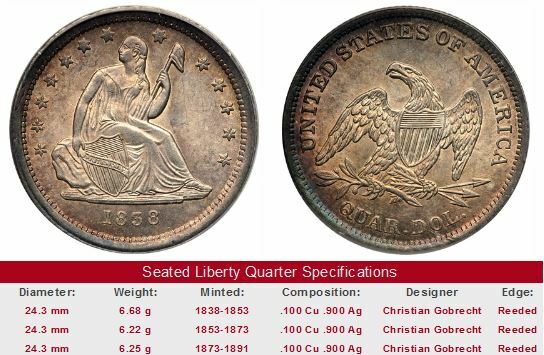 One of the most bizarre stories in all of numismatics involves the 1866 No Motto Seated Liberty Quarter. Only one example is known to exist. It was included in a special set of three coins (quarter, half dollar, and dollar) created as a favor for a friend of the Mint, a pharmacist named Robert Coulton Davis, who was said to have slipped opium cocktails to Mint personnel on occasion. For the better part of the next century, the coins were passed from one appreciative owner to the next. In October, 1967, the trio, along with 7000 other coins, were stolen from the Willis du Pont family home in Coconut Grove, Florida, by a group of armed robbers. None of the 1866 "No Motto" coins were seen again until 1999, when a Los Angeles coin dealer stumbled upon the quarter, mixed in with a large number of relatively common coins. Upon further investigation, it was confirmed to be the quarter stolen from the du Ponts 32 years earlier. The quarter is today on display at the American Numismatic Association in Colorado Springs, CO., now reunited with its "No Motto" half dollar and dollar siblings, also recovered in separate incidents. Arrows at the sides of the date on Seated Liberty coinage were not added for decorative purposes. Rather, they were added to denote that a change in weight for the coin type had occurred. Arrows at date for the 1873 Seated Liberty Quarter indicate an increased weight of 6.25 grams. 1873 quarters without arrows weighed only 6.22 grams. Another great rarity in the Seated Liberty Quarter series is the 1873-CC No Arrows. Mint records indicate that 4000 of the "No Arrows" quarters were coined at Carson City in 1873, but all of them were ordered destroyed when the word came from back east to start making quarters of 0.482% greater weight, to be denoted by arrows on either side of the date. Apparently, at least five of the 1873-CC No Arrows were preserved, and today have achieved legendary status with numismatists. The last public sale of the famous coin occurred in March 2005, when an MS-63 example brought $201,250 on the auction block. A good place to find online coin auctions is at eBay. Many thousands of coins are for sale every day. As you'll agree, none of the key date Seated Liberty Quarters are cheap, but you can buy with confidence you'll someday be selling (should you choose to) at a much higher price. Warning: Do not buy these rare coins, or any rare coins for that matter, unless they've been certified by one of the "Big Four" grading services, PCGS, NGC, ANACS, or ICG. Too many of these other lesser known grading outfits have caused bad experiences for collectors to take a chance. The left hand side of each "Sales Box" is value trend data over a very long period of time for the date headlined, in G-4 condition. The percent annual increase is computed for comparative purposes. Because these coins are so rare, you won't always find one for sale, even on eBay. If not, keep checking back. The coin pictured for sale in the right hand side (if any) is not necessarily an example in G-4 condition.